The World Happiness Report is a landmark survey of the state of global happiness that ranks 156 countries by how happy their citizens perceive themselves to be. This year’s World Happiness Report focuses on happiness and the community: how happiness has evolved over the past dozen years, with a focus on the technologies, social norms, conflicts and government policies that have driven those changes. 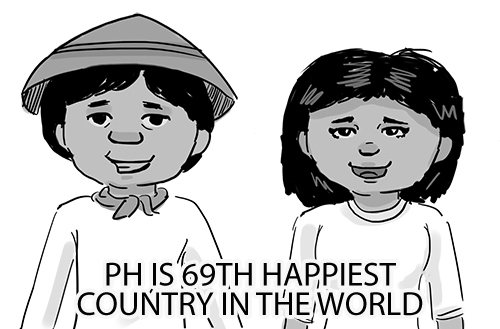 The Philippines is the 69th happiest country in the world, according to a United Nations report released on the International Day of Happiness. The Philippines ranked higher than its Southeast Asian counterparts like Malaysia (80th), Indonesia (92nd), Vietnam (94th), Laos (105th), Cambodia (109th) and Myanmar (131st). The country, with an average score of 5.631 in 2019, slightly moved from its place last year—at 71st out of the 156 countries ranked. Filipinos, in general, are known to have ‘mababaw na kaligayahan’ meaning we are happy with simple things in life. We smile even through the difficult situations in life, that’s who we are, I think. Credit: Philstar.com. Read more about the report at worldhappiness.report. This entry was posted in Values and tagged happier Filipinos, happiness, World Happiness Report 2019 on March 30, 2019 by Mommy Yam.